A land of spiritual and historical importance, Kurukshetra is among the most visited tourist attractions in the state of Haryana. The verdant land that one can witness today, a long time back covered with the blood of Kauravas (characters on the wrong side of Dharma in Mahabharata Epic) who lost the Kurukshetra war. Having imposing history of centuries, it is said that this was the place where the battle for the Kingdom of Hastinapur had been taken place between Kauravas and Pandavas. The place is associated with the preaching about Karma Yoga by Lord Krishna to 'Paarth' - a name with which Lord Krishna used to call Arjuna. With its sacred colors, Kurukshetra is indeed a special place for all those who wish to take a deep insight into the enriching traditions of ancient India. Kurukshetra's history is related with the legendary story of Mahabharata. Gotten its name King Kuru the antecedent of Pandavas and Kauravas, it is deemed that the king selected this place nestled at the banks of the revered River Saraswati to embed theology with eight qualities, which are Truth (satya), Kindness (daya), Yagya (puja), Austerity(tapas), forgiveness (kshama), Brahmacharya (bachelor), Charity (dena) and purity (sucha). His determination and devotion overwhelmed Lord Vishnu and as a result he blessed him with two boons. The first one was that the place would be recognized by his name forever. The other one was that liberation would be achieved by anybody passing away in Kurukshetra. The land was also hailed by various names in different eras such as Dharmakshetra, Uttaravedi and Brahmadevi. 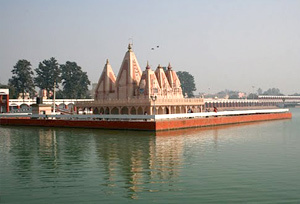 Brahma Sarovar: Brahma Sarovar is a picturesque lake where exquisiteness, history and myths overlap each other. Surrounded by an array of sacred temples, it proffers salubrious and pleasant ambience to the devotees. Moreover, the Sarovar has its mention in the ancient book called Kitab-Ul-Hind, which was written down by Alberuni (advisor of Turkish Ruler Mahmud Ghaznavi). Bhadrakali Temple: Addressed to Goddess Bhadrakali, the shrine is one of the Shakti Peethas where desires of the devotees are deemed to be nurtured. According to the myths, the Pandavas had offered prayers to Goddess Durga to attain a benefit of victory in the battle of Mahabharata. Sthaneshwar Mahadev Temple: Another celebrated site that holds close connection with the Pandavas kith and kin, Sthaneshwar Mahadev Temple is one of the highly visited Shiva Shrines in the striking town of Kurukshetra. 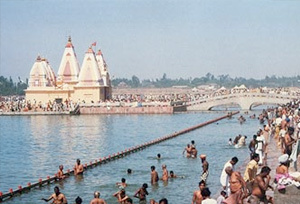 There is a holy tank situated next to the temple which is believed to have some medicinal properties. Krishna Museum: Set up in 1987 by Kurukshetra Development Board, Krishna Museum has portrayed the different characters of Lord Krishna from 1st century to 11th century. There are many things in the museum that will certainly allure the attention of the visitors including Lord Ganesha statue, wooden panels, palm-leaf etchings and miniature paintings. By Air: The closest airports to reach Kurukshetra are Chandigarh and Delhi situated at a distance of 86 Km and 175 Km respectively. Travelers arriving from overseas can get down at Delhi International Airport and from there hire a taxi to Kurukshetra. By Rail: Kurukshetra has its own railway station that connects to the main cities of India. By Road: Kurukshetra is well connected to the major cities encompassing Chandigarh, Patiala, Amritsar, Delhi, Panipat and many more by excellent roads. One can also take a bus or a taxi to make it to the place.